Click here to see a map of our facilities in the Osa. Staying at Piro gives you quick access to mature rainforest as well as to the coastal habitat along the Pacific, making this research station the ideal campus for researchers, field biology student groups, and sea turtle volunteers. Finca Osa Verde, our most recently acquired property adjacent to our biological station, consists of pasture and forest, as well as 1.1 miles of coastline with sea turtle nesting habitat. This 10-hectare wildlife-friendly farm is designed to be a model for the Osa region. We promote mindful eating, climate-smart strategies, and locally adapted food production techniques. We also house on this property our native tree nursery and the beginnings of our botanic garden. The Greg Gund Conservation Center (GGCC) is a nearby satellite educational campus with trails leading through restored secondary forest and primary forest. This campus is ideal for researchers and field biology groups interested in studying reforestation or education groups holding large classes on forest ecology. Conservationists pay special attention to endemic species because their small home ranges make them vulnerable to extinction. One of the most beautiful and rare Osa endemics is the Yellow-billed Cotinga and we believe there are only a few hundred individuals of this bird left. To protect the Yellow-billed Cotinga we recently obtained 30 acres (12 hectares) of protected habitat that the YBC uses for nesting and feeding. We are actively reforesting this area with trees native to the Osa, and that the Cotingas use for food and nesting. Students, researchers and visitors to Osa Conservation can arrange to visit the Sanctuary and hopefully catch a glimpse of the Yellow-billed Cotinga. 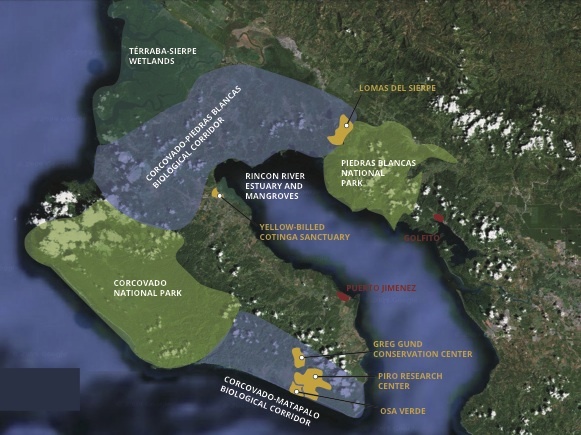 In the biological corridor that connects Corcovado National Park with Piedras Blancas National Park, there is a set of conservation properties that Osa Conservation protects. 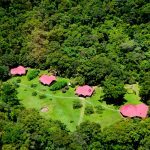 These properties are adjacent to Piedras Blancas National Park and protect a stretch of the Esquinas River, which spans the main road into the Osa extending down into the Sierpe watershed, and feed an important mangrove area in Central America. For the past three years we have been actively reforesting areas of these properties that formerly had exotic plantations with native Osa species. And this year we completed construction of an education center which can host up to 20 students. Click here for further reading and research sources.